The Daily Planet is one of the crown jewels of Squamish. An absolute classic with continuously sustained climbing in an incredible setting. Pitch 1 of the Planet. A contender for the best single pitch on the Chief. In 1981, Perry Beckham, Mike Beaubian, and John Simpson aided the impressive corner system on the left side of the Sheriff’s Badge. In 1982 they returned for a free attempt. Pushing the line to end of the famous undercling on pitch 3. The team was able to free all but one short section. Beckham`s working name for his free climbing masterpiece was Rhinestone Cowboy. Before the team was able to return and send the route, Peter Croft and teenage upstart Hamish Fraser slinked in and jumped on the route. Legend has it that Croft easily sent pitch one, lowered down and pried off a some loose flakes that Beckham had used on his free attempt, significantly increasing the difficulty. The team then pushed the route beyond the previous highpoint to the end of the singular crack that defines the route. Claiming the first ascent and dubbing the four pitch line The Daily Planet. The relatively short fourth pitch, although very aesthetic, ends in the middle of nowhere. If this route had a fault it was that it felt like it never really finished. Beckham returned in 1986 with Brooke Sandhal of Smith Rock fame with the aim of completing the route to its logical conclusion, the ledges below the massive overhangs of the Sheriff’s Badge. The fifth pitch involved, desperate, reachy, face climbing. The new pitch gave the route it’s much needed ending and the routes penultimate first ascent. The Beckham/Sandhal finish proved to very desperate and has had few known free repeats. Although giving the route a needed conclusion, the difficulty is out of character compared to the rest of the climb. This combined with the decaying quarter inch hardware significantly curtailed the popularity of any of the climbing above pitch three, even though the .10d pitch 4 shouldn’t be missed. In 2012, as part of their fixed anchor replacement initiative, The Squamish Access Society commissioned local guides Andre Ike and Colin Moorhead to replace anchors and protection bolts on the Planet. During this time they spied what looked like a possibly easier variation to the final pitch. Upon completing the restorations of the original line they turned their attention to the variation. 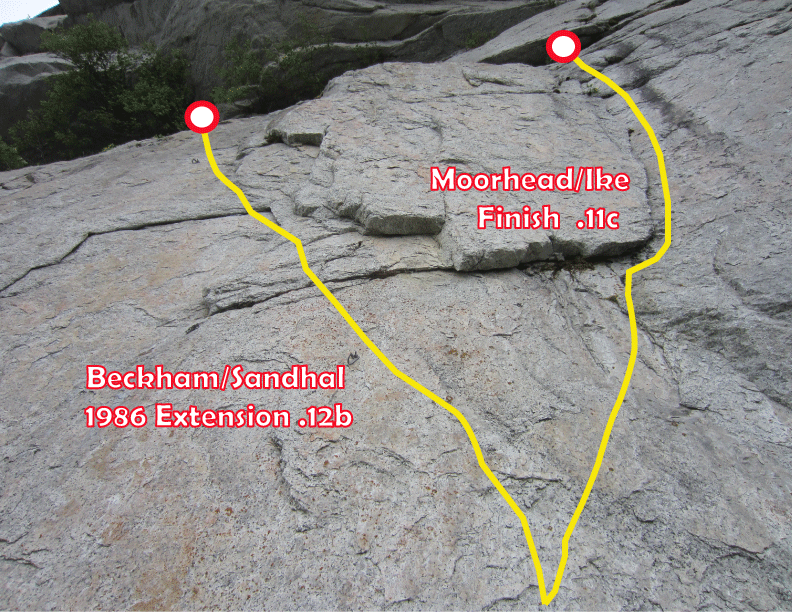 Tackling a shallow corner to the right of pitch 5, the technical layback and stemming problem is protected by three bolts. Although a little grainy, the climbing is excellent and will quickly clean up with more traffic. Checking in at 5.11c this pitch is more in character with the difficulty of the climbing below. 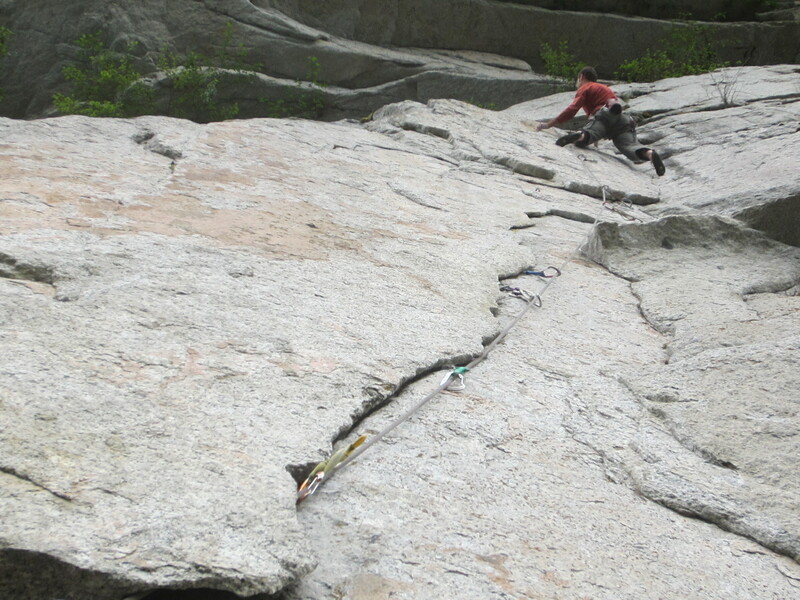 This pitch is best combined with the .10d crack pitch below, skipping the pitch 4 anchor. A little bit of new climbing has made a huge difference to the overall climb, making an incredible climb even better. View of the final headwall variations above the .10d flake crack. For those who haven’t had enough, they can try and snag a rare repeat of Beckham/Sandhal, Rhinestone Cowboy finish. Climbing the alternate 5.11c finish of the DP. Just found this piece by accident and would like to set the record straight. I aided what became the 1st pitch proper in the rain belayed by Blake Robinson (Ward’s cousin). When Mike, John and I returned to try the route free, I led the first big corner pitch free in one go on my second attempt using a flake feature right of the current crux. Mike and I free climbed all the way to the end of the underling. Back then, Croft couldn’t keep his hands off other people’s projects. He broke the flake I used on the first pitch and freed the new variant and pushed the route forty feet above Mike’s and my high point and called it a first ascent. Brooke and I pushed the route up to the roof which seemed a logical high point. Tony McLane amazed us all by continuing way right, turning the roof and freeing the original Badge route to the top to create The Daily Universe.